We return once again to the Band. But they are one of my absolute favourites, so no apologies from me, I’m afraid! When first contemplating how to record their third album, The Band intended to record it in front of an invited audience at a Woodstock theatre called the Playhouse. Unfortunately, the town council weren’t keen on the idea of hordes of rock fans descending on their little community, and as they had with the festival nine months earlier (which was eventually staged at Max Yasgur’s farm at Bethel), they put the kibosh on it. Not that the town’s elders were opposed to rock musicians in general or the Band in particular – in one interview Rick Danko revealed that the local judges and the police referred to them rather fondly as ‘the boys’. But with their first plan not viable, instead the Band decided to use the Playhouse as a studio and record in private, setting up on the stage and turning the prop cupboard into an ad hoc control room. Producer of the first two albums John Simon was eased out and in his place was the incongruous red-trousered, green-haired figure of Todd Rundgren, Albert Grossman’s latest boy wonder. 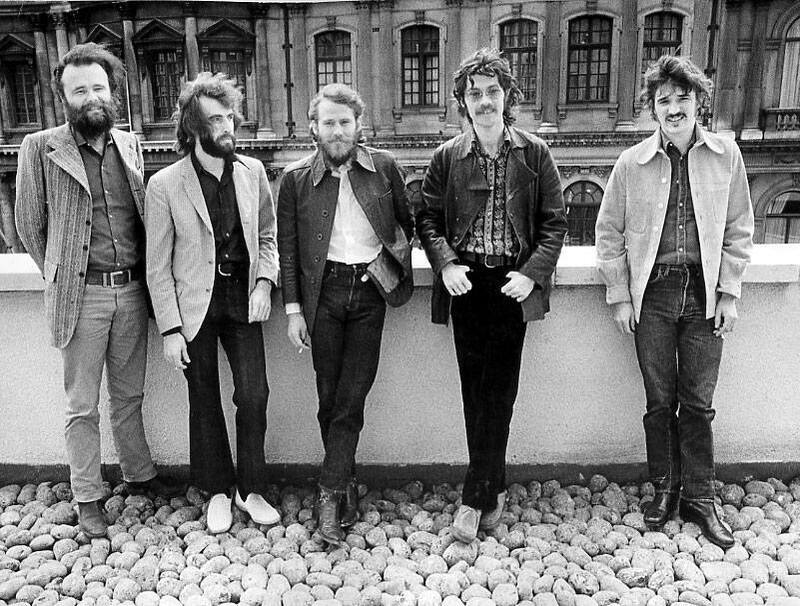 There was reportedly some tension, particularly between the Runt and Levon Helm. One can only imagine. It would be a fool’s errand to try to argue Stage Fright is on the same level as the Band’s first two albums. It’s not. There’s something alchemical, something magical, that exists in their early work but that is evident only fitfully from Stage Fright onwards. By this time, the Band had divided into factions: the partiers (Danko, Helm and Manuel) and the ‘grown-ups’ (Robertson and Hudson). If he hadn’t been before, Manuel was now a full-blown alcoholic; Danko was an undiscriminating user of whatever was being offered; and Levon was taking fistfuls of downers, which undoubtedly mellowed him out, but didn’t do much for his ability to get up in the morning. Undoubtedly all of this had an effect on the Band’s cohesion and focus, but even more serious was the drying up of Richard Manuel the songwriter, who had been such a presence on the Band’s first two albums (he wrote or co-wrote In a Station, We Can Talk, Lonezome Suzie, Whispering Pines, Jawbone and When You Awake) and the increasingly humourless didacticism of Robertson’s own po-faced and overwrought songs. The lightness of touch he brought to Jawbone and Across the Great Divide would be less and less evident from hereon in. This knowledge makes it hard to take the lyrics of Sleeping at face value; the desire to be cocooned and protected from the world was all too real for these guys. Nonetheless all the members of the group step up as players (the instrumental chorus is ecstatic, and Helm’s jazzy drumming superlative) for Manuel’s last great songwriting effort. As with the Manuel songs on The Band, though, it’s actually a Manuel-Robertson co-write, and one wonders how much the lyrics are Robbie projecting himself into the shoes of his bandmate. This entry was posted in Music and tagged Albert Grossman, Bethel, Garth Hudson, In a Station, Jawbone, John Simon, Levon Helm, Lonezome Suzie, Music From Big Pink, Playhouse, Richard Manuel, Rick Danko, Robbie Robertson, Stage Fright, The Band, The Band (album), Todd Rundgren, unusual recording venues, We Can Talk, When You Awake, Whispering Pines, Woodstock, Yasgur's farm on May 31, 2014 by rossjpalmer.